I've been playing around with my SU! Lattice die, and lookee what I came up with! 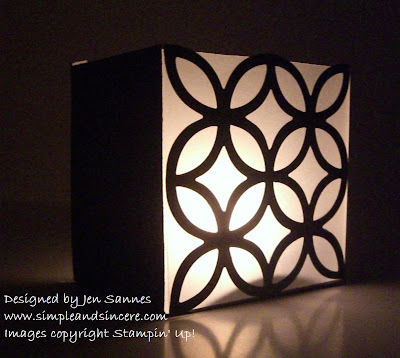 I thought it would be fun to make a votive candle holder using the Lattice die, some vellum and cardstock to complete the box. 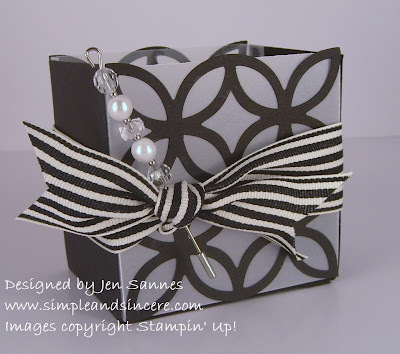 I think the possibilities with this are endless - think of all of the color combos! Wouldn't this make a cool Halloween or Christmas decoration? :) Can you tell I'm a *little* excited?!! 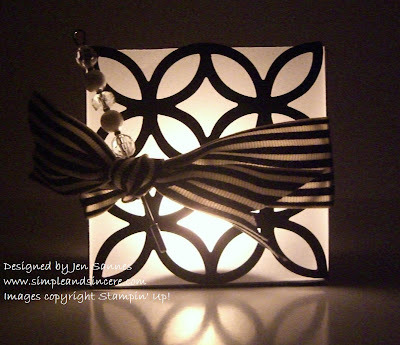 I removed the bow, to show what a pretty effect the Lattice die gives the candle holder. I love how you can see the light shine through the front and the back. I'll try and get a tutorial put together, or at least the dimensions, to make assembly a little easier for you! WOW!!! This is soooo totally AWESOME!! I gotta try it! !